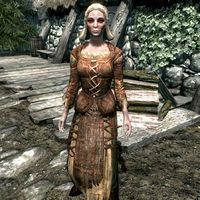 Tekla is a Nord citizen of Falkreath, where she works as a maid to Dengeir of Stuhn, who believes she is spying on him for his nephew, Jarl Siddgeir. She is Solaf's girlfriend, and Narri's sister. Narri occasionally asks her boss, Valga Vinicia the innkeeper, to consider hiring Tekla, though she will always decline saying she cannot afford to hire both of them. Tekla is evidently distressed by Dengeir's doubts about her, and will often be encouraged and thanked for her hard work by Dengeir's brother, Thadgeir, when Dengeir fails to do so himself. Despite Dengeir's doubts about her, he also evidently trusts her greatly; if the Stormcloaks take Falkreath, Dengeir will be appointed jarl. He will in turn appoint Tekla as his steward. If asked how she became a steward, she will respond, "Comes down to trust, I expect. After Dengeir gave up his seat to his nephew, he didn't trust anyone. Everywhere he looks, he sees assassins, spies an' plots against him. I'm the only one he confides in. So, when he was made Jarl again, he didn't wait a moment to name me his Steward. He said I was the only choice." She will also be very nervous about her new higher station—when you make this observation she will say, "I should think so! I'm well used to taking care of a house and the folk living in it. Taking care of the entire hold is another matter entirely. It would be a big enough job without the war on and the dragons about. I just hope I can do right by the good folk who are looking to us to see to their needs." As steward, she may sometimes give you bounty letters and if you have the Hearthfire add-on, she will also sell you the land upon which Lakeview Manor is built. If the Empire retakes Falkreath, she will join Dengeir in exile in Candlehearth Hall in Windhelm. She wears a set of farm clothes, a pair of boots, and a hat. She carries a key to Dengeir's house, and a selection of common loot and gold. This page was last modified on 20 June 2015, at 17:39.